2008 Supertec G25P-50NC 10” x 20” NC Cylindrical Grinder s/n GR08001 w/ PLC Controls, Hand Wheel Controller, Motorized 5C Work Head, 12,000/18,000 RPM, 16” x 2” Wheel Cap, Tailstock, Work Head Swivel Angle +30 Deg/-90 Deg, Table Swivel Angle +7 Deg/-9 Deg, Wheel Dresser, Coolant Filtration System. 2008 Supertec G25P-50NC 10” x 20” NC Cylindrical Grinder s/n GR07010 w/ PLC Controls, Hand Wheel Controller, Motorized 5C Work Head, 12,000/18,000 RPM, 16” x 2” Wheel Cap, Tailstock, Work Head Swivel Angle +30 Deg/-90 Deg, Table Swivel Angle +7 Deg/-9 Deg, Wheel Dresser, Coolant FiltrationSystem. 2008 Supertec STC-1206NC Automatic Centerless Grinder s/n CA07004 w/ PLC Controls, 0.04”-1.18” Grinding Cap, Wheel Dressers, 12” x 6” Grinding Wheel @ 1900 RPM, 8” x 6” Regulating Wheel @ 15-310 RPM, +-5 Deg Swivel Angle, +-5 Deg Inclining Angle, Coolant Filtration System. Myford MG12-M 5” x 12” Universal Cylindrical Grinder s/n SM157324 w/ Motorized Work Head, Tailstock, Coolant. Myford MG-12 5” x 12” Universal Cylindrical Grinder s/n S54308 w/ Motorized Work Head, ailstock,Coolant. Myford MG-12 5” x 12” Universal Cylindrical Grinder s/n S45843 w/ Motorized Work Head, Tailstock, Coolant. Makino C-40 Universal Tool and Cutter Grinder s/n E47-5545 w/ Compound Dual Wheel Grinding Head, 5 ¼” x 37” Table. Makino C-40 Universal Tool and Cutter Grinder s/n E47-5541 w/ Motorized Work Head, Compound DualWheel Grinding Head, 5 ¼” x 37” Table. Makino C-40 Universal Tool and Cutter Grinder s/n E43-3445 w/ Compound Dual Wheel Grinding Head, 5 ¼” x 37” Table. Makino C-40 Universal Tool and Cutter Grinder s/n E43-3178 w/ Compound Dual Wheel Grinding Head,5 ¼” x 37” Table. Makino C-40 Universal Tool and Cutter Grinder s/n E43-3172 w/ Motorized Work Head, Compound Dual Wheel Grinding Head, 5 ¼” x 37” Table. Makino C-40 Universal Tool and Cutter Grinder s/n E43-3171 w/ Compound Dual Wheel Grinding Head,5 ¼” x 37” Table. Makino C-40 Universal Tool and Cutter Grinder s/n E43-3170 w/ Compound Dual Wheel Grinding Head,5 ¼” x 37” Table. Makino C-40 Universal Tool and Cutter Grinder s/n E43-3018 w/ Compound Dual Wheel Grinding Head,5 ¼” x 37” Table. Makino C-40 Universal Tool and Cutter Grinder s/n E42-2570 w/ Compound Dual Wheel Grinding Head,5 ¼” x 37” Table.Makino C-40 Universal Tool and Cutter Grinder s/n D42-2514 w/ Compound Dual Wheel Grinding Head,5 ¼” x 37” Table. Makino C-40 Universal Tool and Cutter Grinder s/n D41-2251 w/ Compound Dual Wheel Grinding Head,5 ¼” x 37” Table. Cincinnati Universal Tool and Cuter Grinder s/n 31512T5V-71 w/ Single Wheel Grinding Head, 6” x 36”Table. Cincinnati Universal Tool and Cutter Grinder s/n 1D2T6S-176 w/ Single Wheel Grinding Head, 6” x 36”Table. Cincinnati Universal Tool and Cutter Grinder s/n 1D2T6S-161 w/ Single Wheel Grinding Head, 6” x 36”Table. Cincinnati Universal Tool and Cutter Grinder s/n 1D2T2T-175 w/ Single Wheel Grinding Head, 6” x 36”Table. Cincinnati Universal Tool and Cutter Grinder s/n 1D2T1L-2409 w/ Single Wheel Grinding Head, 6” x 36”Table. Cincinnati Universal Tool and Cutter Grinder s/n 1D2T1K-125 w/ Large Diameter Drill Grinding Attachment, 6” x 36” Table. Cincinnati Universal Tool and Cutter Grinder s/n 1D2T1F-259 w/ Single Wheel Grinding Head, 6” x 36”Table. 1997 Acer Ultima-3VKII 2-Acis CNC Vertical Mill s/n 97030235 w/ Acu-Rite CNC Controls, 3Hp Motor, 60-4200 Dial Change RPM, Chrome Box Ways, Power Knee Feed, 10” x 50” Table. Cut-King Vertical Mill w/ Sargon 3-Axis DRO, 3Hp Motor, 70-4200 Dial Change RPM, Chrome Ways,Power “X” and “Y” Feeds, 10” x 54” Table. Supermax YC-1 ½ VS-99 Vertical Mill s/n F980558 w/ Newall Topaz DRO, 3Hp Motor, 60-4200 Dial Change RPM, Chrome Ways, Power Feed, 9” x 48” Table. Kondia mdl. G Power Mill s/n F-398 w/ 2.2kw Motor, 60-4200 Dial Change RPM, Power Feed, 9” x 42”Table. Kearney &amp; Trecker / Milwaukee mdl. CH No. 2 Universal Horizontal Mill s/n 16-8590 w/ Universal Milling Head, 25-1500 RPM, 50-Taper Horizontal Spindle, 40-Taper Vertical Head, Power Feeds, 12” x 56” Table, Arbors and Supports. Kearney &amp; Trecker / Milwaukee mdl. H No. 2 Plain Universal Horizontal Mill s/n 45-4852 w/ Universal Milling Head, 35-1400 RPM, Power Feeds, 10” x 50” Table. Cazeneuve 17” x 40” Geared Head Gap Bed Lathe s/n 9776-B8 w/ Acu-Rite Programmable DRO, 40-3200 RPM, Inch/mm Threading, Tailstock, Indexing Tool Post, 10” 3-Jaw Chuck. Jet GH-1440W-3 14” x 40” Geared Head Gap Bed Lathe s/n 1211W3068W w/ Acu-Rite Programmable DRO, 40-1800 RPM, Inch/mm Threading, Tailstock, Steady and Follow Rests, KDK Tool Post, 6 ½” 6-Jaw Chuck, 8” 4-Jaw Chuck, 12” and 10” Face Plates, Coolant JFMT-Amura J4-360A 14” x 40” Geared Head Gap Bed Lathe s/n 067 w/ 58-2000 RPM, Inch/mm Threading, Tailstock, Steady and Follow Rests, KDK Tool Post, 5C Collet Closer, 8” 3-Jaw Chuck, 10” 4-Jaw Chuck, Coolant. 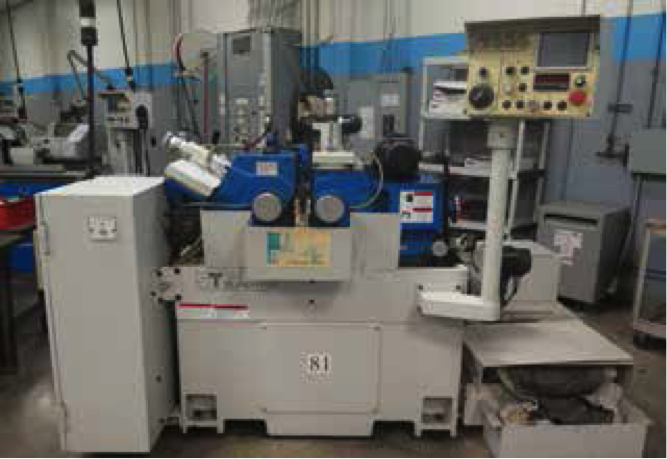 Supermax LE-1338 13” x 38” Geared Head Gap Bed Lathe w/ 35-2000 RPM, Inch/mm Threading, Tailstock, 6 ½” 3-Jaw Chuck. Hardinge HC Hand Chucker s/n HC-4596-S w/ 125-3000 RPM, 8-Station Turret, Power Feeds, 5C Collet Closer, Coolant. Cut-King Vertical Mill w/ Sargon 3-Axis DRO, 3Hp Motor, 70-4200 Dial Change RPM, Chrome Ways, Power “X” and “Y” Feeds, 10” x 54” Table. Kearney &Trecker / Milwaukee mdl. H No. 2 Plain Universal Horizontal Mill s/n 45-4852 w/ Universal Milling Head, 35-1400 RPM, Power Feeds, 10” x 50” Table. Jet GH-1440W-3 14” x 40” Geared Head Gap Bed Lathe s/n 1211W3068W w/Acu-Rite Programmable DRO, 40-1800 RPM, Inch/mm Threading, Tailstock, Steady and Follow Rests, KDK Tool Post, 6 ½” 6-Jaw Chuck, 8” 4-Jaw Chuck, 12” and 10” Face Plates, Coolant. JFMT-Amura J4-360A 14” x 40” Geared Head Gap Bed Lathe s/n 067 w/ 58-2000 RPM, Inch/mm Threading, Tailstock, Steady and Follow Rests, KDK Tool Post, 5C Collet Closer, 8” 3-Jaw Chuck, 10” 4-Jaw Chuck, Coolant. (2) Donaldson Torit MDV-6000 Industrial Air Cleaner s/n IG736501. Sunnen MBB-1600 Precision Honing Machine s/n 42433. Ex-Cell-O Style 175 Large Capacity 10” x 68” Center Lapping Machine s/n 175-0150. Jet HBS-1018H 10” Horizontal Band Saw s/n 15052866 w/ 4-Speeds, Manual Clamping, Work Stop, Coolant. 9” Horizontal Band Saw w/ Manual Clamping, Coolant. Leten DCM-5 20” Vertical Band Saw w/ Blade Welder, Dial Speed Indicator, 19 ½” x 23 ½” Table. Delta 13” Vertical Band Saw. Kalamazoo 14” Abrasive Cutoff Saw. Central Hydraulics, 20 Ton H-Frame Press. Clausing mdl. 1689 Variable Speed Pedestal Drill Press w/ 330-4000 RPM. Central Machinery 8” Table Model Drill Press. Trexler 5Hp Horizontal Air Compressor w/ 3-Stage Pump, 120 Gallon Tank, Arrow Refrigerated Air Dryer. 120 Gallon Air Storage Tank. Universal Finishing Machines “Uni-Hone” Dry Blast Cabinet w/ Dust Collector. ICM AD-A-Blast Dry Blast Cabinet w/ Dust Collector. Myford, Cincinnati Makino and Jack Mill Motorized Work Heads and Compound Grinding Fixtures. Weldon and K.O. Lee Endmill Grinding Air Fixtures. Sunnen Mandrels, Stones and Truing Sleeves w/ Cabinet. 5” and 4” Compound Machine Vises. Bridgeport and Import 90 Degree Milling Heads. Cushman 8” 3-Jaw Indexing Chuck. (2) Kearney &amp; Trecker 6” 3-Jaw Compound Dividing Chucks. 5C Indexing Heads, Spin Fixtures, Collet Closers and Collet Block Sets. (85) R8 Tooling and Collets. Lista 7-Drawer and 5-Drawer Tooling Cabinets. Barber-Colman 6” x 18” Bench Center. 12” x 18” Sine Table. Deltronic Video Inspection System w/ Deltronic Video Probe, (2) VI-150 Fiber Optic Light Sources, Color Monitor, Computer System. Mitutoyo TM201 Tool Makers Microscope s/n 50164. (3) Mitutoyo TM100 Tool Makers Microscopes. (2) Hover ABS Tool Makers Microscopes. (2) Scherr Tumico mdl. 98-0001 Tool Makers Microscopes. Mitutoyo BI-5 Microscope w/ Digital Micrometer Heads. (2) Weldon “Cutter Geometry Checker” Scopes. Kodak mdl. 30 30” Floor Model Optical Comparator w/ Acu-Rite Qwikcount 2X DRO, Surface and Profile Illumination, Centers and Acces. Kodak mdl. 30 30” Optical Comparator w/ Surface Illumination, 5 ½” x 27” Table. 20” Optical Comparator w/ Quadra-Chek III Programmable DRO, 6-Lens Selector, Surface and Profile Illumination, 8 ½” x 32” Table. J &L PC-14 14” Floor Model Optical Comparator w/ MicroVu Q16 Programmable DRO, Surface Illumination, 6” x 30” Table. (2) J &L PC-14 14” Floor Model Optical Comparator w/ Acu-Rite Qwikcount DRO, Surface Illumination, 6” x 30” Table. J & L PC-14A 14” Floor Model Optical Comparator w/ Metronics Quick-Chek DRO, Surface Illumination, 6” x 30” Table. (6) J & L PC-14 14” Optical Comparators w/ Surface Illumination, 6” x 18” Table.